Years before he turned his camera toward making the unsettling, atmospheric horror movies Onibaba [review] and Kuroneko [review], Japanese filmmaker Kaneto Shindo undertook far more grounded subject matter in the 1960 release TheNaked Island. This neorealist paean to the tough life of one rural family is an unflinching study in the drudgery of survival, a year in the life fashioned into a graceful narrative about struggle and failure and finding success simply by sticking together. Shindo’s screenplay focuses on a family of four: a father, a mother, and two young sons. One is old enough to go to school, the other is not. The school, like most everything, is across the waves on another shore. 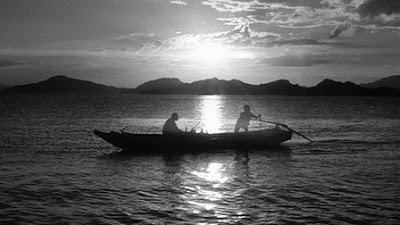 So isolated is the family’s island, in fact, that they have to sail to a different island just to fetch fresh water. This trip is made several times a day, to get water for the family meals as well as to feed the meager crops that grow on the hillside that oversees the homestead. Theirs is not an abundant life out there on the ocean. Catching a fish is a cause for celebration. Literally. 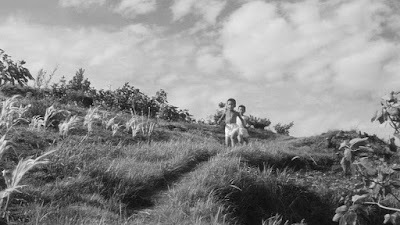 In one divergent sequence, the family goes to the mainland to sell a fish one of the boys caught and have a day out. With a little money to burn, they dine at a small restaurant and ride a funicular: simple joys hard earned. Hardship is the key here. Shindo wants to show us how rough the family has it and how it takes all four of them to get by. He approaches the narrative in the manner of a documentarian, avoiding any editorializing, and outside of one tragic moment, eschewing any large drama. There are only small occurrences. 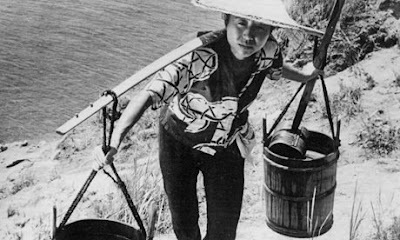 A spilled bucket elicits a slap, but then husband and wife (played by Shindo regulars Taiji Tonoyama and Nobuko Otawa) pick up the pieces and carry the remaining bucket jointly. Not a word is exchanged between them. In fact, hardly a word is exchanged in the entirety of The Naked Island. 40 minutes pass before we first hear a human voice, and even then it is children chanting and singing. There are only a couple of lines of dialogue in the whole picture. Again, it’s about those small occurrences. Shindo’s intent is to use the “silence” to focus us on the everyday action of the family’s routine, and by stripping away all else, imbuing those actions with added importance. In the absence of distraction or convenience, work is everything. If the routine is broken, if they fail to fetch the water, if they fail to maintain the small patch of land that sustains them, the family will have nothing. 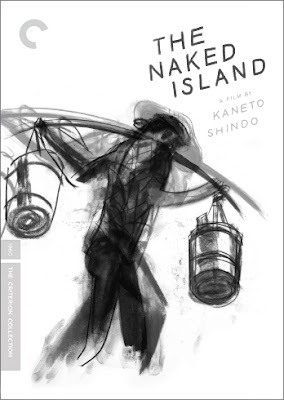 Though this may make The Naked Island sound tedious or claustrophobic, the film is anything but. Shindo artfully gives the story scope by showing us more than the immediate area around the individuals. He regularly pulls back to show us the island and the ocean, the natural splendor that surrounds them. There is an irony here, in that what we see might resemble paradise, but it’s far from a vacation spot for those who live there. They aren’t sending out postcards of their shoreline. 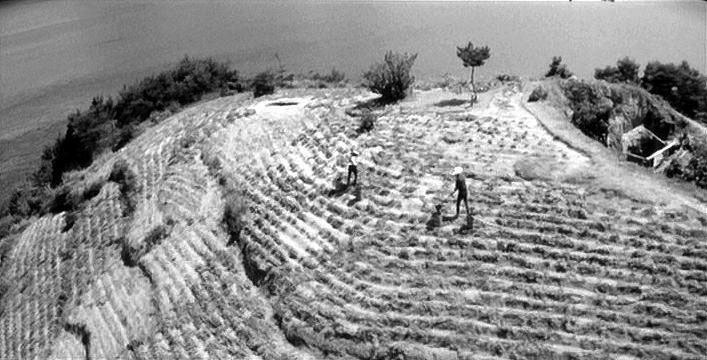 Accompanying Shindo and director of photography Kiyomi Kuroda’s camerawork is Hikaru Hiyashi’s evocative music. The Death by Hanging-composer adds an elegiac touch to some of the scenes, and a melodic counterpoint to others. His rhythms lend a sense of ceremony to the daily ritual. As difficult as life on the island may seem, one can’t help but think that Shindo intends to draw some kind of comparison to modern living. How less predictable are most people’s lives? How many people don’t leave for work at the same time each day to perform the same tasks day in, day out? It seems only the rewards are different. Yet, it’s hard to see The Naked Island as any kind of indictment of modern excess. On the contrary, Shindo does not evoke any romantic notion of a simple life. I am not even sure we can intuit any kind of existential satisfaction in a job well done. By the end, the father is as inscrutable as ever, and the mother even harder to understand. As the only character to outwardly show her dissatisfaction--be it in the momentary respite she finds in the bath, or a breakdown she suffers in the movie’s penultimate scene--we can only guess as to what is going through her mind as the movie ends. She lowers her head so the brim of her hat shields her eyes, and we are left to read the bottom half of an expression that reveals very little. There isolation continues, and though they have each other, we must wonder if it is enough. When they go to town, they are outsiders, but yet the boy who goes to school has found community, making him part of something larger and, arguably, more meaningful. Is it possible that Shindo is really telling us that no family is an island? I suppose that’s for each of us to interpret and debate, and it’s part of what makes The Naked Island so intriguing. Though, were you to want to know more, you can certainly dive into the usual extras, including two features with the director himself: a 2011 video interview and an older commentary track featuring both Shindo and Hiyashi. Other extras include actor Benicio Del Toro (Traffic [review]) expressing his love of the film, and also a bit from film scholar Akira Mizuta Lippit.